Unlimited access to all courses, ebooks, live instruction, lesson plans, and critiques. Download all instructional videos to your computer to watch later without an internet connection. 30 day money back guarantee and easy cancellation. A two-part series of lessons on drawing with alcohol-based markers. Part one explores basic applications techniques including creating an underpainting of tones. Basic forms are drawn. In part two, an architectural sketch is created with drawing pens. Tones are developed before layering color applications over the top. 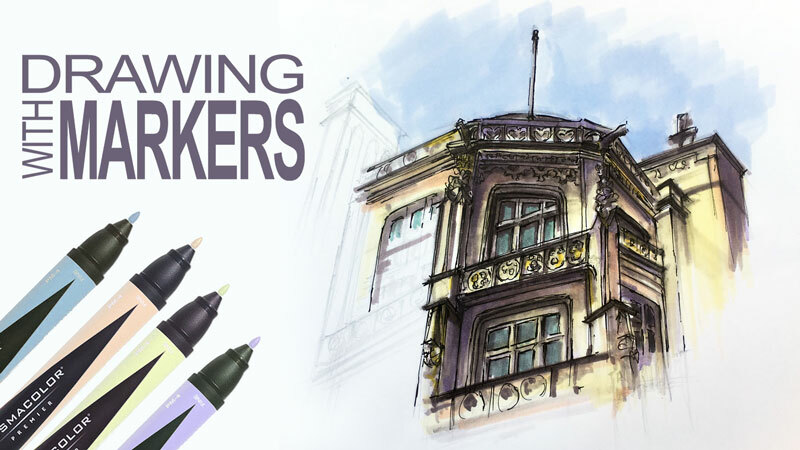 This lesson series is perfect for those wishing to get started drawing with markers. Went through this exercise today. I have a full set of Spectrum Noir markers and have used them a bit. Just felt like I was capping and uncapping constantly, trying to find just right color *and* value. VERY helpful to learn how to do an “underpainting” in just the grays. THEN apply the color. I also did the Skull alcohol marker exercise that the newsletter link led me to. Cant wait to try lesson to & finish the Biltmore picture!! Just now finished Lesson 2. I NEED MORE EXERCISES! 🙂 These 2 lessons & the skull exercise have made me glad I bought all these markers! With these techniques you show us, Matt, I can do the style of art *I* like to do–more realism or abstract. I was worried these markers were good only for manga or pop art or whatever those illustration styles are called. They’re growing on me, but it’s not what I prefer to draw at the moment. Please let me know any suggestions you have for other subjects to try drawing using the “underpainting” with colors overlain. Or can you provide any pictures or links to images you think might be good to try? Thanks!! Does drawing over other colors mess up the marker tips? No. They are designed to be layered. You can layer to your heart’s content without fear of destroying the marker! I was very interested in this application/medium, and I was trying to source the ones used in the video, but being in Australia, I’m not sure that I can. I have looked up a few Art supply shops in my vicinity and they appear to stock the ‘Winsor & Newton’ – Brush Marker, Pro Marker, and WC Markers. Will these be sufficient? Does it matter which one? They also have a Copic Mulitliner Fineliner available. Will this be a good place to start? You’ll want to look for alcohol-based markers. The Brush Marker line by Winsor and Newton is alchohol-based, so it should do the trick.